Most cyclists like people to be able to see what they’re riding around on, but not artist Jimmy Kuehnle. 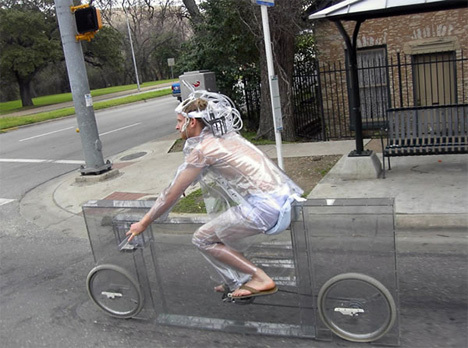 His invisible bike is completely transparent (save for a few components), and when he rides it he wears an invisible outfit to match. Built in 2005, the bike is as much a performance piece and sculpture as it is a mode of transportation. It’s made of Lexan (also known as “bullet proof glass”) except for the wheels, chain and bearings. 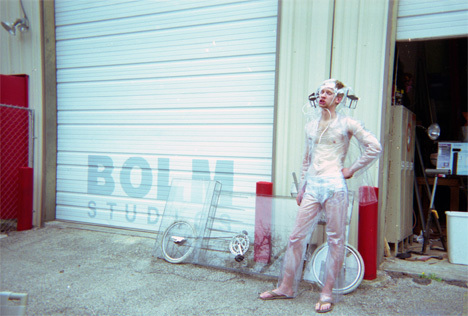 The artist’s bike-riding outfit complements the bike perfectly, giving spectators an eyeful of Kuehnle. Even his headgear is made of clear plastic tubing. Although the bike is a moving work of art – literally – it is very low to the ground so obviously the rider has to take some care not to bottom out while riding. 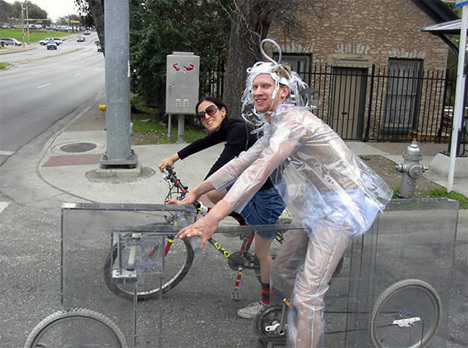 Kuehnle doesn’t appear to have any plans to mass-produce his invisible bike, so the rest of us will just have to keep riding our plain old visible bikes – transparent clothing optional. See more in Bikes & Cycles or under Transportation. March, 2013.